Whew, I didn't think I was going to be able to post another photo again, after what I just went through - software support for my Norton security software left my system in such a state that I couldn't easily download photos and nor could I even launch my photo software! But I persevered on my own and fixed the problem. Working with any support organization can be such a nightmare these days. But enough of that. I'd like to introduce you to my new baby garden. I've probably given you glimpses of it before, like when I showed you back in late winter the lovely black soil I put in. I purchased about half of the plants online from High Country Gardens and the rest (mostly 'Goldsturm' rudbeckia and some grasses) came from my back gardens. I wish you could see the rudbeckia today as it's really blooming like crazy (I took these photos very early Friday morning). The garden still has a ways to go to fully fill out but I'm liking it more. The plants I purchased online took their sweet time filling in though. In fact, one of the grasses I purchased is still kind of mopey. But others are doing well, like this coreopsis below. These coreopsis have been blooming since spring and they continue to fill out. Definitely keeper plants. 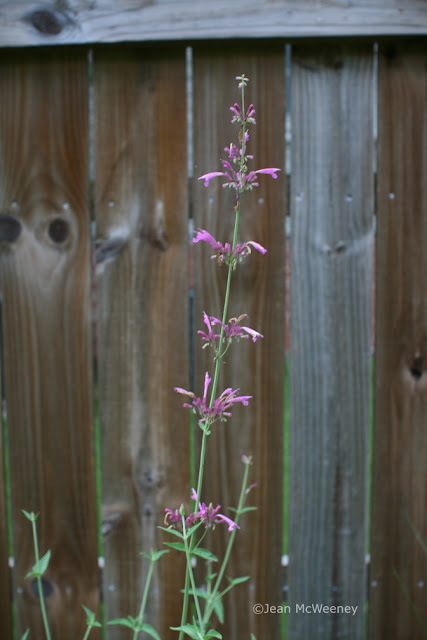 This agastache, 'Ava', was also purchased online. The color and floriferousness of the blooms is nothing like the catalog, surprise, surprise! :-) But the catalog also said that it could take two to three seasons to reach mature size, so I'm hoping for the best. I've been pleased with the fact that it grew quickly, and really happy that a plant that does so well in New Mexico is actually thriving in Louisiana (of course, we're experiencing a severe-level drought now!). The grass in the photo above, 'Fireworks' pennisetum, has gone through a lot since I bought it last year. Last year, one of the neighborhood cats kept munching on it, so it never got very big and didn't bloom. This year it went through grasshopper hell but survived. The nice thing about this particular grass is how it looks in the spring time when it's first coming up - bright pink leaves. But now it looks like any other purple fountain grass to me. I'm hoping in the fall it colors up better. I'm getting very excited about my upcoming trip to Buffalo, NY, and all the great gardens I'll see at Buffa10, a garden bloggers meet-up. But most of all, I'm really looking forward to seeing friends I made from last year's meet-up in Chicago and making new friends. Nothing like garden geeks to help you get the creative juices flowing! See you all soon I hope! 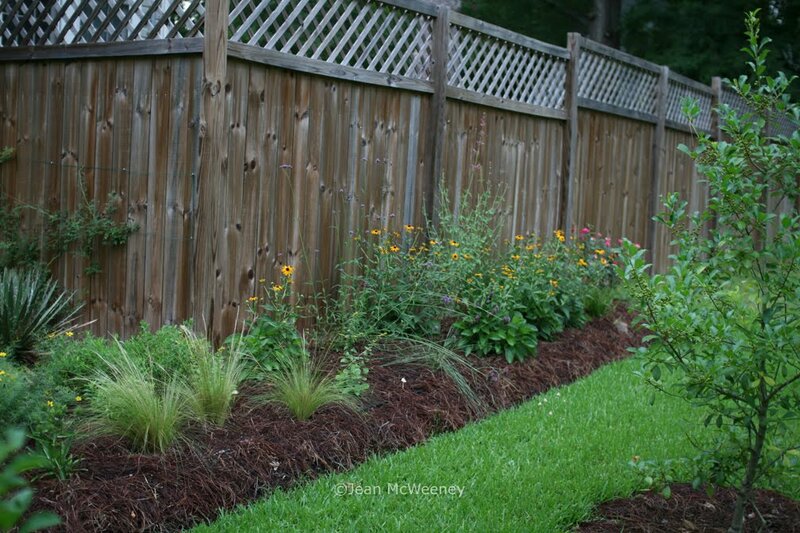 Your new plantings look great. I'm looking forward to seeing what your gate looks like as I'm working on a gate design now, too, for my veggie garden. The new garden is coming along very well. 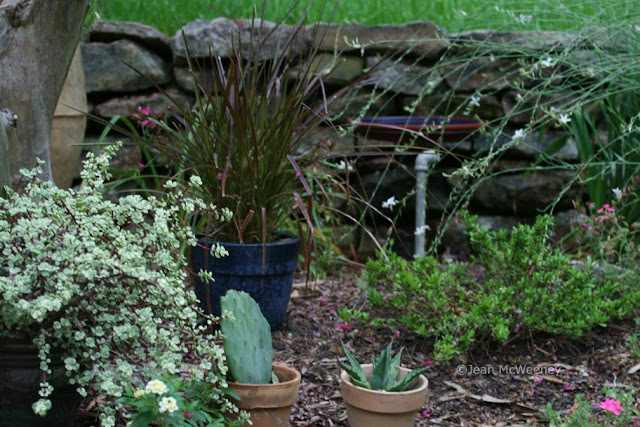 The Opuntia really sets off the grasses. I'm looking forward to seeing you again & maybe having an actual conversation. Jean, I love the new baby garden already and I know a gate will set it off perfectly. See you in 3 days! It all looks lovely--and I am very happy about getting to see you in person again THIS week! Can't belive it is so soon. Monica - the edges are hand dug. In hindsight I wish I had put some wood edging in, much like I have for the raised beds in the back. But I couldn't find anyone to make them so I went with hand digging. Kind of a pain, really, but it looks nice I guess. I wish we were going to see you in Buffalo this year! Lovely new bed there. Don't you just love High Country Gardens? They are my fave for mail order. I got my Agastaches there, too, I have Acapulco Pink and Salmon and love them. 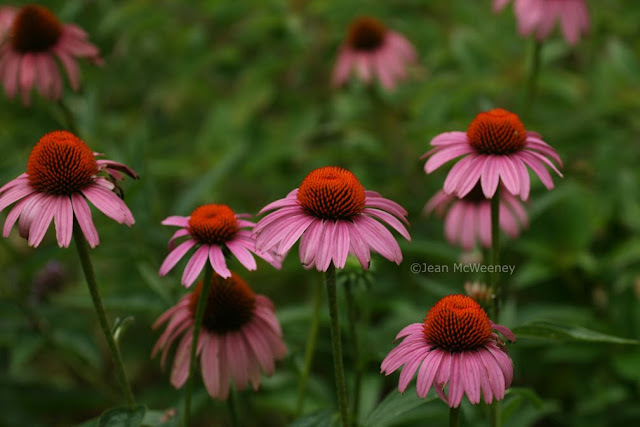 Your Coneflowers are so pretty, too -- they are just perky, aren't they? 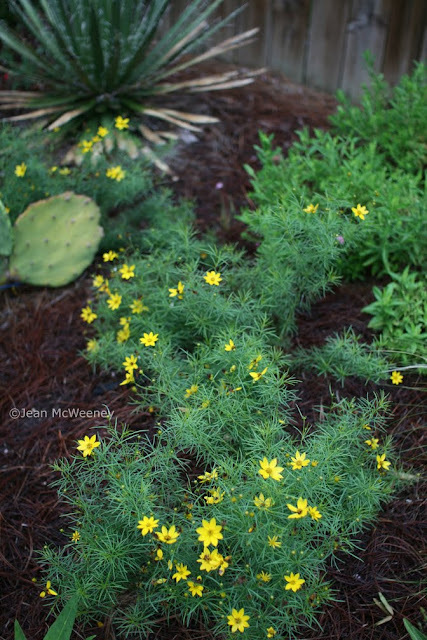 I hope those dainty little coreopsis don't get as gigantic as mine did this year - they were easily 4-5 feet tall! Looking forward to seeing you in Buffalo! I can't believe that was the same patch of soil we saw earlier. 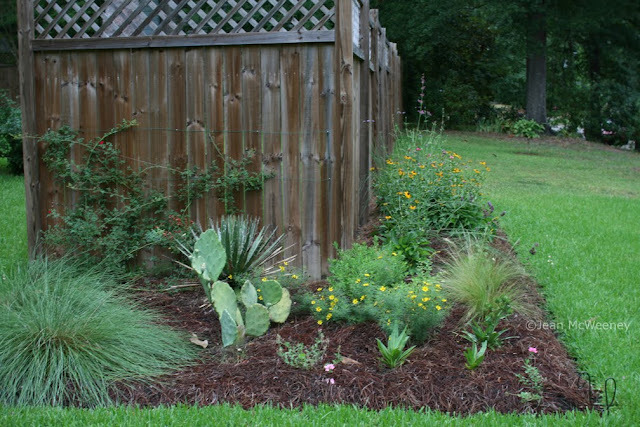 It looks really nice now, a good choice and variety of plants. I love Coreopsis Zagreb, a tough little plant with gorgeous flowers. Your baby garden is looking good. Have fun in Buffalo. Can't wait to see the photos you have to show. Lovely garden. And the purple coneflower picture is an ethereal dream. 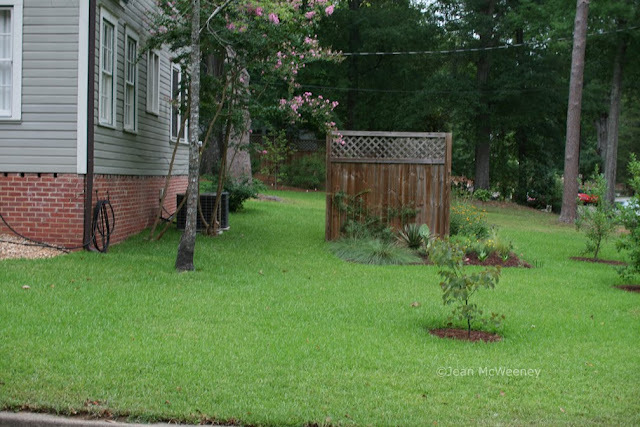 Your yard looks so green for a severe drought. I remember a Florida drought when we 'only' got 42 inches of rain. Before the end of the last drought here in the Texas Hill Country, we had a 12-month space of 12 inches, total. Regardless, you planted your New Mexico beauties in a raised bed and they'll probably flourish. Kathleen, it is weird how green my lawn looks considering the drought conditions. And I don't even have an irrigation system there! For some reason, maybe because it's on the downhill side of my sloping yard, it doesn't need that much water. But we are 12 inches behind in just the last 3 months. It's been a shocker to most of the plants. Your coreopsis is wonderful. I purchased that one as a plant a few years ago and it just sits there doing nothing.. Maybe it's time to give it a new home. Everything looks like it is growing well for you. Baby gardens aren't such for long with the rain and heat we have, are they? Your new garden looks great, Jean! The coreopsis looks as though it is really taking off. I have a 'Moonbeam,' and it has seemingly doubled in size this year. Hope you are having a great time in Buffalo! Wish I were there, but I'll enjoy seeing all the photos you bring back. Your baby garden looks great! Almost every area of my yard gets full sun, so everything is looking fried right now. I need to take some inspiration from you and plant things that can even survive in the desert! Smart!